Dang, Mt Shasta Mean Lady. The things artists have to go thru to hustle their art. Hope you gained something other than gas money from the experience. You’d think a person with a business catering to spirituality needs would have been a bit kinder, but I guess not. I’m not sure what I gained other than gas money. The realization that even woowoo people can be jerks? The realization that maybe a person isn’t spiritual just because she owns a store that sells items for one’s “spiritual journey”? I’d like to say at that moment I learned to let the negativity of other people roll right off me, but that’s a lesson I’m still working on. After I left the mean lady’s store, I went to a rock shop where the people working were really nice to me. I didn’t sell any bracelets there (hemp didn’t seem like a good fit with their other merchandise), but just having them be nice to me made me feel a lot better. I guess some people like to burst the bubbles of others…..I’ve run into them in my world too….I try to avoid them but it’s not possible. Fortunately there are more of bubble blowers out there……love to you my friend……. Thanks, Jennifer. I love your idea that there are more bubble blowers than bubble bursters in the world. YES! oh i am disgusted to read about these assholes, yes they are assholes. As an artist who has sold her work since 1984 I have encountered many a screaming a-hole and wept many tears. If you can, find some flea markets and such to sell your lovely work, wear your stuff and sell it off your body – I have had folks buy the earrings right off my ears! But I hate shop owners. If you can, set up an ETSY shop or use another online venue. Use paypal and go for the gold! Your work is lovely and an online venue, if you don’t already have one, would be great. I apologize in behalf of the assholes who don’t know they are assholes – be of good cheer and know your readers support you! Thank you, Ruth. Your sweet comments really made my day. Yes, some people are jerks. I don’t know if they do it on purpose or just don’t realize they are being mean. I am getting better at letting it slide over me and not taking on the negativity of others, but it is a constant struggle. I don’t currently have an Etsy shop or other online store, although I do post items on my Facebook page from time to time. I’ve hesitated to set up an online store because I am sometimes away from internet access for weeks at a time. I do have PayPal, however, and I do take orders from folks who contact me through the blog or through Facebook. Thank yo for reading and commenting. I am glad you have a paypal account! I once read about a gal who did beadwork and lived out of her van. She said “I go everywhere decked out like a Christmas tree, and people just come over and ask me about my jewelry – that ‘s how I sell it!” I thought that was fantastic and followed her advice. Adorn yourself with your creations and keep them close to you in your travels! Most of us would rather buy from individuals selling their work than marked up imports. Trust your work, it is so unique! Awwwe, Blaze, so sorry to hear that you were treated with such disdain! I learned a few decades ago that the people who put themselves out as “spiritual/religious” are actually the ones to stay away from. The meek, kind souls don’t need to flaunt their spirituality. Blessings to you my friend! Thank you for this wisdom. I agree that truly spiritual (and truly generous and truly kind) folks don’t need to make a big deal about what they do or what they believe. I hope the mean lady is in a better state of mind than she was when I met her. I appreciate you reading my blog. Wow. Tough story. I’m impressed with your ability to deal with people who have hang ups about this and that. 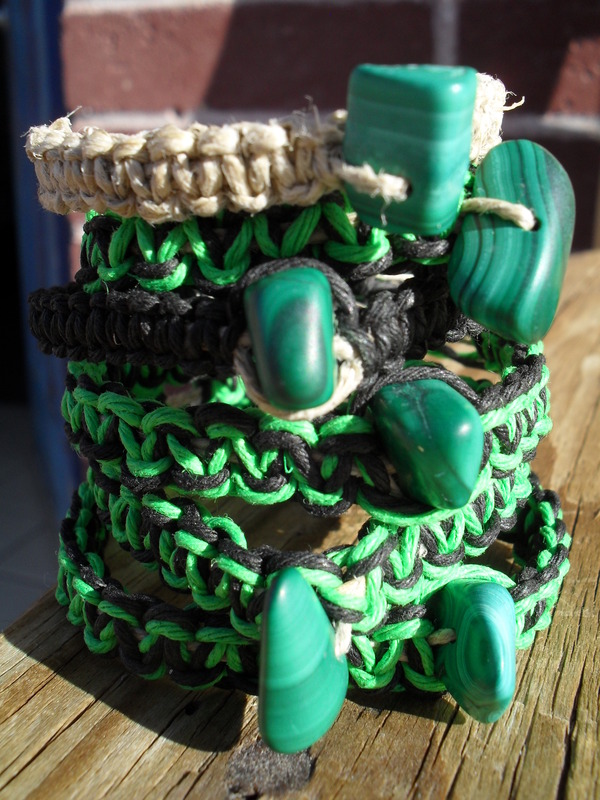 Your hemp tourquoise bracelettes pictured are beautiful! I’d buy those!!! Thank you for your kind words, Ernest, both about my jewelry and about my ability to deal with people. 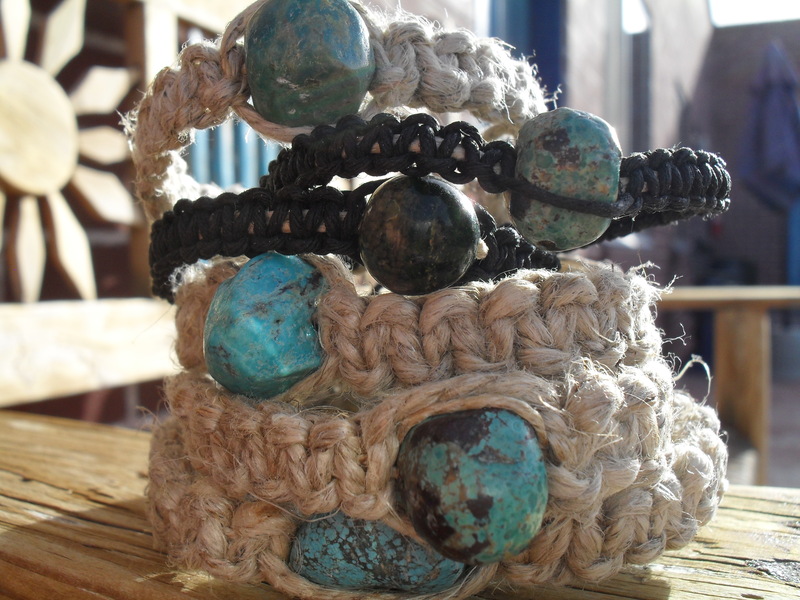 Yes, those turquoise hemp bracelets were very popular and sold quickly. I’ll let you know if I ever run into a good price on turquoise beads again and make more bracelets like those. Well, I love the bracelets and would love to buy a couple. Wish I had a store and I would stock up. Do you have any brownish beaded necklaces available? Thanks for the kind words about my bracelets, Val. If you had a store, I would give you a really good deal so you could afford to stock up on my them! Those bracelets with malachite and turquoise stones went really fast, but I have other bracelets with healing stones, skulls, snake bones, peace signs, and other assorted beads and baubles. Let me know if you are interested in bracelets with any of those decorations. I’ll PM you on Facebook with some photos of different necklaces I have available, or maybe I could do something custom for you. Midge, thanks for understanding how the mean lady made me sad. Yes, she could have said what she wanted to say in a much nicer way. I don’t know how to make sense of people. I do my best to be nice, but I know I fail too many times. Maybe she was just having a bad day and wishes she had been nicer. I will try to think about her next time I am about to be mean to someone.